I was recently in contact with David Lane, owner and operator of "19" as seen below. Now for all you real Invader enthusiasts out there, this is a rael opportunity to get involved in the preservation and maintenance of one of the great examples of its kind in the world today. Read the text below and if there are enough of us who get together........................Who knows what we can achieve. David Lane who was trained to fly the A-26 at Air Spray, has owned and flown Invader 313 ( The first A-26 to be converted to an air tanker) since 1999 and since the recent economic troubles of the U.S. airlines (passed on to its employees) this has unfortunately dictated that he puts 313 out to pasture for a while. The operating costs just to fly ( In David's words ) the bloody thing, were well over $2000. per hour, but he said, it was fun while it lasted let me assure you!! I have no information about the STOL (short takeoff and landing) A-26 wing tip mod but I know someone who might. Darcy Hankins, pictured above. He is, in my opinion, the world's best authority on the A-26 and its modification history having been one time maintenance supervisor for Airspray's fleet of Invaders. He is pictured here installing the co-pilot flight controls in my A-26 in 2008. The controls originally came out of one of the Viet Nam era K models which crash landed at Chino in the mid '70's after one of the props went into reverse as it approached the runway. The controls were later installed in Whistler's Mother in the early 1980's. Then after the purchase of Whistler's Motherits by Kermit Weeks, the controls were removed as the aircraft was being restored to factory specs. with its original single pilot controls plus these dual controls were not manufactured by Douglas rather by On Mark engineering Van Nuys for the B-26K. Its a unique arrangement as the control column can be removed in flight to allow access to the C model nose section.... an mod engineered at the request of the Brazillian Air Force during the 60's... so that their co-pilots could also function as bombadiers. The photo below is of 313 after it was sold at a government auction for $1776. in 1957. It belonged to the 730th bomb squadron in Korea (The Rebels) and was known as the Magnet due to its affinity to attract flying metal. Repair patches are still all over the old gal. 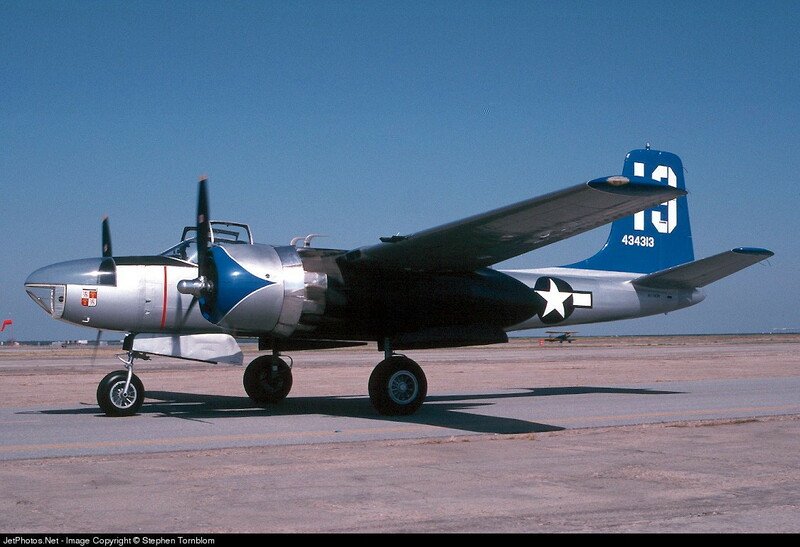 313 was the first B-26 to be converted into a "Borate Bomber" in 1960 and flew in this capacity for the next 26 years.... retired by Conair as Tanker 23. It ended up with the Canadian RAF museum near Toronto from whom I purchased it in 1999. You have a photo of it under Misc. Military when it was there. Future plans for the Invader are to have a second set of controls installed along with a top turret. Maybe then I can generate some interest in sponsors (ie. some rich, non-pilot, dot-com types just dying to get their hands on the controls) so that the aircraft won't languish too long while on display at the San Diego AeroSpace Museum at Gillespie Field. 1945-50- Initially delivered to Hunter AAF, Savannah, Georgia then to storage at McClellan AAF, Sacramento, California. 1951 - To Douglas Aircraft, Long Beach to receive latest factory mods/upgrades. To Hill AFB, Ogden, Utah for further modification prior to being deployed to Korea. Invader 313 converted to a glass nose “C” model. Both .50 cal turrets were removed along with the aft gunners periscope/hardware and replaced with a SHORAN receiver-transmitter and navigator’s station hardware. Ferried to Miho, Japan June ’51 to join 452nd Bomb Wing 730th (Long Beach) Bomb Squadron “Rebels.” Tech. Sgt. Bill Dawson and Byron “Curly Davis were assigned as 313′s crew chiefs and then based at Pusan East, (K-9) South Korea. 313 became the personal aircraft of the Squadron Commander and named “Sweet Eloise II” after his wife. Later was named “Junio” (Spanish for its June arrival month?) by Squadron Commander Nevling who had replaced the squadron’s original Commander. December 27, 1951- Invader 313 took a direct 40 mm hit to its fully loaded bombay badly injuring 1st Lt. Raymond Koch (USAF #AO2065993) seated at the navigator’s station- table in the aft compartment. Fire, hydraulic failure, partial control (cable) failure forced the crew to divert to K-46, the nearest AFB. 313 was later ferried to Miho, Japan for repairs. Returned to K-9 with a new black paint job to make the ship less visible. 1952 - February 1952- Invader 313 took a 40mm flak hit to its glass nose which destroyed its Norden bombsight and shattered the co-pilots canopy as well. The 452nd Bomb Wing timed out in 1952 and was decommissioned. 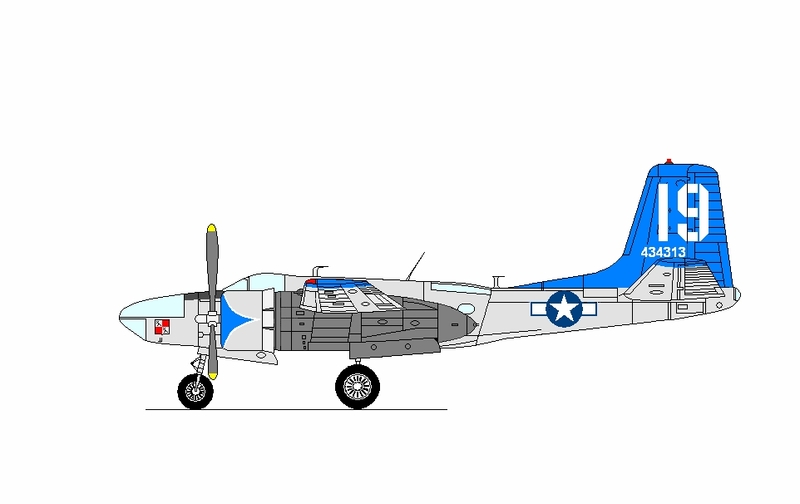 In May Invader 313 was reassigned to the 17th Bomb Wing, 95th Bomb Squadron “Kicking Mules.” It became the Squadron spare aircraft but nobody wanted to fly “The Magnet” due to its notorious reputation for attracting flak and bullets according to 1st Lt. Fox who flew his 50th and final mission in 313. 1953 - July 27, 1953, 313 flew a SHORAN mission over North Korea on this the last official day of the Korean conflict. Invader 313 had accumulated app. 1900 combat hours in two years. 1953-57 - To storage at McClellan AFB, Sacramento. 1957 - Invader 313 was sold at a government surplus auction for $1,776.00 and received its FAA civil registry of N5457V. 1958 - Modified for cloud seeding, Watsonville, California. 1959 - Sold to Aero Atlas, Red Bluff, California. 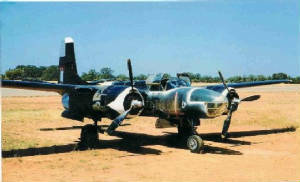 1960 - Invader 313 became the first B-26 Invader of its type to be modified as a “Borate Bomber” for firefighting operations. Became Tanker 27. 1961-65 - Sold to Wilson Aviation Industries, Lewiston, Idaho DBA. Hillcrest Aircraft. Invader 54V operated as Tanker 20 after being fitted with a hard “B model” nose. 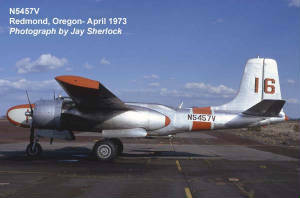 1965-74 - Sold to Butler Aircraft, Redmond, Oregon. Became Tanker 16 and fitted with STOL wingtips. 1974-87 - Sold to ConAir, Abbotsford, BC (registered as C-GHLK) and became Tanker 23. Invader 313 accumulated app. 2000 total hours of fire fighting operations prior to being retired in 1986. 1987- 88 Invader 313 was donated by ConAir to the Reynolds Aviation Museum, Wetaskiwin, Alberta. 1988-90 C-GHLK was sold to Don Crowe, Victoria, BC. (causing high drama at ConAir who donated the aircraft.) Invader 313 was repainted in the WWII livery of the 319th Bomb Group A-26 Invaders based at Okinawa, Japan in 1945 with #13 on tail. It was also refitted with a “C model” glass nose. 1990-99 Sold to Dennis Hamilton/Canadian Warplane Heritage Museum, Mt. Hope, Ontario and Invader 313 was occasionally operated in the air show circuit on the East coast. 1999-2011 - Sold to David Lane, Poway, California. 313 flew with the San Diego Wing of the CAF at various Southern California air shows and then later displayed at the San Diego Air and Space Museum, Gillespie Field. Number “19” repainted on the tail. Force - Air Group One, San Diego Wing, Gillespie Field, San Diego, California, United States. On December 27, 1951, Junio, one of twelve bombers on a nightly sortie over North Korea, took a direct hit from a 40mm anti-aircraft shell. The explosive round entered the belly of the Invader through its fully loaded bomb bay, exploded, and ricocheted off one of its 500-pound bombs, endangering the lives of the crew of four. Hot, jagged shrapnel pierced the aft bulkhead and badly injured the first lieutenant, but the bomb that took the hit was unarmed and the crew courageously flew the wounded aircraft to an airfield just south of the North Korean demarcation line.In those frantic minutes, they manually pumped the alternate hydraulic system to lower the gear, using every bit of the emergency brake system’s air bottle pressure to halt the stricken aircraft. After repairs the aircraft was returned to combat duty and in February 1952 took a flak hit to its glass nose which destroyed the Norden bombsight and shattered the copilot’s canopy. It was again repaired and returned to duty with a black paint job to make it less visible, and a new nickname, The Magnet, due to its reputation for attracting flak and bullets. Manufactured in 1945 by Douglas Aircraft, the Invader went to Miho, Japan in June 1951 to join the 452nd Bomb Wing 730th Bomb Squadron Rebels, assigned to Pusan East, South Korea.Later assigned to the 17th Bomb Wing Kicking Mules, the aircraft flew it’s final combat mission on July 27, 1953, the last official day of the Korean conflict.Invader 313 had accumulated 1900 combat hours in two years. In 1957, after a few years in storage at McClellan AFB in Sacramento, it was sold at a government surplus action for $1,776 and was modified for cloud seeding in Watsonville before moving to Red Bluff with a new owner in 1959.Soon after it was modified to combat wildfires.Over the years subsequent owners modified the aircraft again and again before it was retired in 1986 after accumulating approximately 2,000 hours of firefighting operations. Its last owner was ConAir of British Columbia. 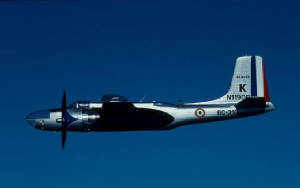 In 1987 ConAir donated the Invader 313 to the Reynolds Aviation Museum in Alberta, British Columbia.Between 1988- 1990, it was sold again and repainted in the circa 1945 WWII livery of the 319th Bomb Group A-26 Invaders based in Okinawa, Japan. It was also refitted with a "C model" glass nose.The old bomber finally made it back to the U.S.in 1999 when it was sold to David Lane of Poway, California.Lane flew it with the San Diego Wing of the CAF at various Southern California air shows and then later displayed at the San Diego Air and Space Museum’s Gillespie Field in El Cajon. Fast forward to July 26, 2011, when pilots and aircraft restorers Steve Penning and Phil Gattuso of Black Crow Aviation, LLC, Windsor, CA, purchased the aircraft and flew it to Santa Rosa after it spent eight years on the ground. Penning says of the aircraft, "The condition of the plane is not bad. It had not flown in eight years, but the previous owner took good care of it. Our plans are to get it fully airworthy and start restoring the plane to the Korean War condition and external paint it had during its combat tour. We want to make it as authentic as possible, keeping safety and operational ease at the top of the list. Once we get it going, we will fly it to air shows and events to exhibit the plane.It’s pretty rare to find a restored warbird these days that actually has combat history. Phil and I are very excited about it.Flying it should be very fun and a bit challenging.There are five passenger seats in the plane, so we should be able to give some rides to people that want to experience this type of aircraft." Military and Civilian history in full. - To Hill AFB, Ogden, Utah for further modification prior to being deployed to Korea. receiver-transmitter and navigator's station hardware. as 313's crew chiefs and then based at Pusan East, (K-9) South Korea. its Norden bombsight and shattered the co-pilots canopy as well. 313 was reassigned to the 17th Bomb Wing, 95th Bomb Squadron "Kicking Mules." who flew his 50th and final mission in 313.
its FAA civil registry of N5457V. Bomber" for firefighting operations. Became Tanker 27. 1961-65 - Sold to Wilson Aviation Industries, Lewiston, Idaho DBA. Hillcrest Aircraft. 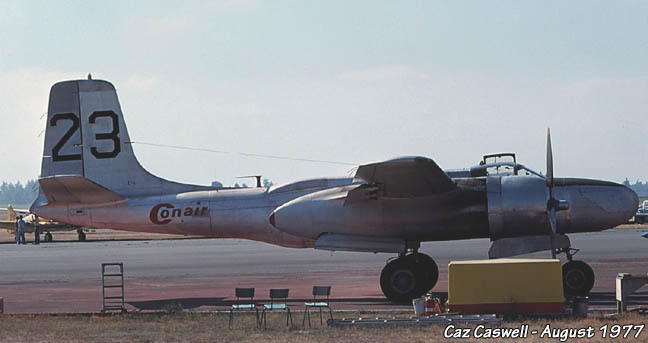 Invader 54V operated as Tanker 20 after being fitted with a hard "B model" nose. also refitted with a "C model" glass nose. and Invader 313 was occasionally operated in the air show circuit on the East coast. Diego Air and Space Museum, Gillespie Field. Number “19” repainted on the tail. The Central Fire Control System installation manuals below, were supplied via David Lane, Thanks David for your help in providing these documents. ......And what does it cost to run one ? I can give you what it cost me in general to fly my Invader N119DR, 44-34313 over the past four years and you can figure out the hourly costs depending on your flying per month estimate. Insurance, liability only for two seats (pilot-co-pilot )no hull insurance: $8,000. per year. Annual Inspection: My average is $25,000. per year. It is said it takes "seven men, seven days" to complete an inspection of an very airworthy A-26 so this would be a conservative cost estimate of the labor involved, and varies with the shop rate or A&P's hourly rate. Parts cost of course will vary depending how good or bad the condition of the Invader and these airplanes always need a lot of something. Fuel and oil per hour in California: $450. based on 150 gallons per hour and a few gallons of oil. When you find someone wealthy who would like to fly an A-26 and share the operating expenses, point him my way will ya? Aero Atlas Inc, Red Bluff, CA, 1959-1961. 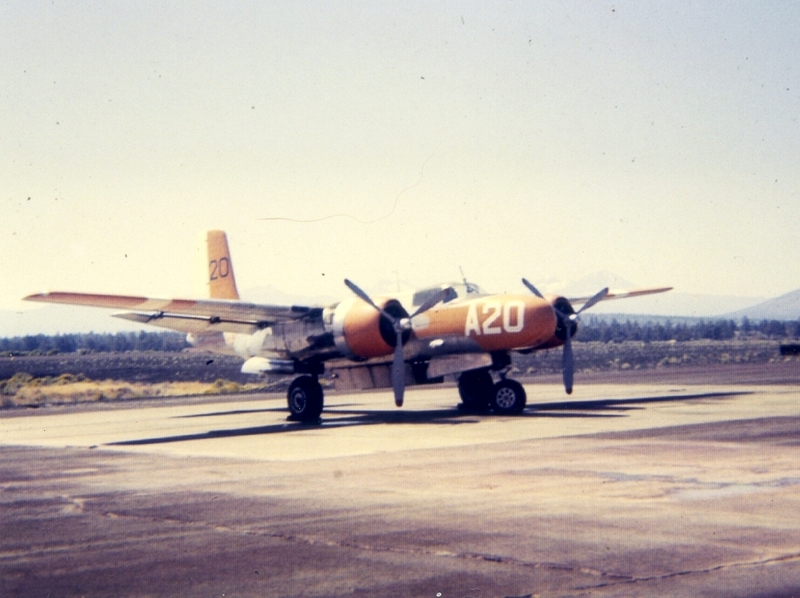 First A-26 converted to fire tanker, 1959. - Flown as tanker #23. Don Crowe, Victoria, BC, 1989-1990. Canadian Warplane Heritage, Hamilton, Ontario, 1990-1999. - Flew as French AF 434313/K/BC-313. Courtesy Aircraft Inc, Rockford, IL, July 1, 1999. David R. Lane, Poway, CA, July 1999-2002. - Flown as French AF/434313/K/BC-313.